We are currently open for submissions. So to Speak is open for submissions to our Summer 2019 Online Issue until the end of the day on April 18, 2019. Blog submissions are open year-round. Please submit book reviews, essays, event reporting, etc. See our website for additional submission information. It's always a good idea to read a few of our blog posts (outside of a limited series) for a sense of what we're looking for. For more information, please visit http://www.sotospeakjournal.org. 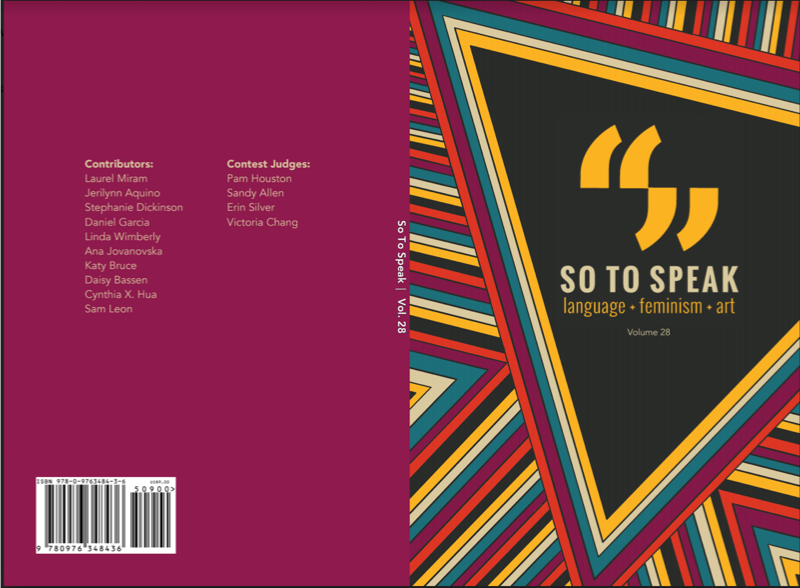 Our Spring 2019 Issue of So to Speak is available for purchase! The work in this issue was selected by judges Pam Houston (Fiction), Sandy Allen (Nonfiction), Victoria Chang (Poetry), and Erin Silver (Art). At every turn, the pieces in this issue strike at the systems that seek to oppress them with such a force that only art can conjure. Their tool of choice? Interrogation. They interrogate everything from the traditional family structure, to racial discrimination and tokenizing, to physical, sexual, verbal, and emotional abuse, to a cruel and corrupt prison system, to harmful conceptions of gender, and more. In the wake of the interrogation comes revelation. And in the wake of revelation comes the rough edges of a vision — one in which the world is reformed, we recognize our bodies’ resemblance and connection to the natural world, in which people live and love however they see fit, and all people can feel equally safe, supported, and financially stable. The cover features multi-colored intersecting angles on the cover. (Look below for a sneak peek.) The cost is $12. You will also receive two complimentary back issues and a limited-edition broadside, while supplies last. Please fill in the shipping information on the following pages to complete your order. Thank you for supporting So to Speak! If you are submitting Visual Art: (1) All submissions must be in .jpg, .tif, or .png formats at 300 dpi; (2) Please label each file as LastName_Title; (3) You may submit up to 5 pieces of artwork in a single entry; (4) Please include the dimensions (if applicable), the medium (if applicable), and an artist statement with a brief description of the submission. Nonfiction and Fiction pieces should not exceed 1,200 words. Please submit one document (doc., docx., or pdf. files) with a single prose piece. All prose submissions should be double-spaced with numbered pages. Poetry submissions should not exceed 8 pages. Please submit one document (doc., docx., or pdf. files) with up to 3 poems. Hybrid work should not exceed 10 pages. Please submit one document (doc., docx., or pdf. files) with a single hybrid piece. Reviews and Interviews should not exceed 1,500 words. Please submit one document (doc., docx., or pdf. files) with a single review or interview. Videos and Podcasts can be variable in length, but should not exceed 20 minutes. Please include a brief summary/artist statement, to be published alongside your video or podcast should we accept your submission. Closed captions are required for videos, and typed transcripts are required for podcasts. Please be sure you have permission to use whatever media (sound, music, visuals, etc.) you incorporate into your video or podcast submission. Video submission will be uploaded in our YouTube account should we accept your submission for publication. Per their guidelines, “YouTube does not set a minimum resolution but recommends a resolution of at least 1280x720 for video that has a 16:9 aspect ratio and a resolution of at least 640x480 for video that has a 4:3 aspect ratio.” We accept .mp3 and .wav file types for audio submissions and .mp4, .mov, and .mpg file types for video submissions. Please submit high-quality video and audio for consideration -- submissions with excessive background noise, issues with lighting or resolution, poor sound quality, etc. will not be selected for publication. If you have questions about your video or audio submission, please send us an email titled “Blog - Video/Audio Submission Question” prior to submitting. A Cover Letter that includes your name, address, phone number, email address, how you heard about So to Speak, and brief bio describing your background as a writer or artist and any applicable awards or publications. A brief description of how you see your piece(s) (implicitly or explicitly) fitting into our intersectional feminist mission.